New versions of some of the most popular truck models in the U.S. will make their public debuts at the Chicago Auto Showthis week. At the top of the list is the Ford Super Duty, the strongest member of the F-Series lineup, the top-selling truck line in the U.S. for more than 40 years. 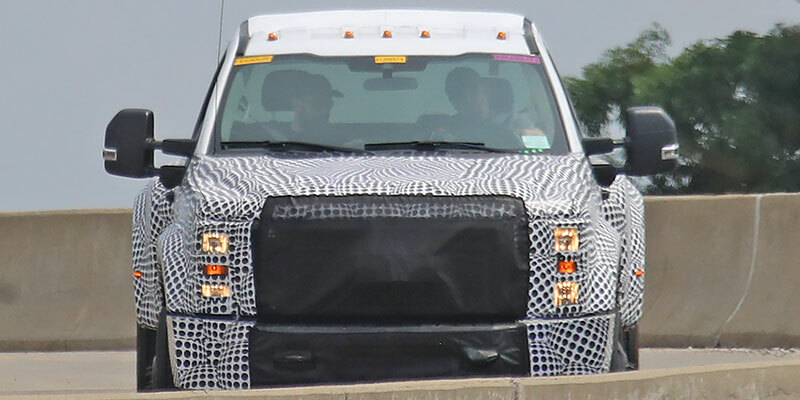 Ford Motor Co. will present a redesigned version of the Super Duty that debuted in 2016 with an all-aluminum body. It is expected to introduce a new gasoline engine and possibly offer variants. The debut of the Super Duty could steal attention away from other key announcements. General Motors will officially show its 2020 Chevrolet Silverado HD, and Fiat Chrysler Automobiles will present the work truck version of its Ram HD. In smaller trucks, the refreshed 2020 Toyota Tacoma is sure to draw crowds. Nissan, Lexus and Range Rover will also show new crossovers to satisfy buyers who are increasingly looking to SUVs and trucks for their everyday lives. The Chicago Auto Show is popular among automakers looking to debut tough and rugged trucks and SUVs. The event’s cavernous halls and proximity to Midwest-based commercial fleets makes it an ideal place to show off large work vehicles. The new pickups from the Detroit Three automakers fit squarely into that mold. The Ford Super Duty and Chevrolet Silverado HD are critical to their respective brands in an intensifying full-size truck race. Sales in the segment increased by 2 percent to more than 2.4 million vehicles in 2018. However, both Ford and Chevrolet lost market share to Ram last year. The Ram Chassis Cab brings a refreshed product into the work truck segment for parent company FCA. General Motors returned to the Class 4 and 5 medium-duty segment in 2018 with its Chevrolet Silverado 4500-5500HD. A new Ram will help FCA fight off the GM newcomer and continue to battle with Ford, which captured more than half of all sales in the lucrative market last year, according to ACT Research. Chicago is a good location for Ford, Chevrolet and Ram to show off tough trucks, Sargent said. Smaller cars will also be on display in Chicago. The latest Alfa Romeo 4C Spider and a special edition of the Mazda MX-5 Miata are aimed at driving enthusiasts. Subaru will show off a new 2020 Legacy sedan. But new crossovers, SUVs and trucks will dominate booths across the show floor. The 2020 Toyota Tacoma, a refreshed version of the top-selling midsize pickup, will continue the brand’s tradition of releasing new trucks in Chicago. Toyota revealed a refreshed Tundra there in 2017 and its TRD Pro line of adventure vehicles in 2018. The automaker will also peel the wraps off its 2020 Land Cruiser Heritage Edition to celebrate six decades of the off-road vehicle’s production. It is expected to be the final Land Cruiser before a completely new generation comes next year. Hot-selling crossovers are also on the reveal list. Nissan will issue updates to its Rogue family of small utility vehicles, and Lexus will show the NX F Sport Black Line Special Edition. Jaguar Land Rover will celebrate the U.S. debut of its compact Range Rover Evoque. Automakers choosing Chicago as the backdrop for such high-volume products signals the growing influence of the show, especially amid the decline of the Detroit auto show. “It’s on par with the other shows largely because of the number of people that show up,” Sargent said. Ford Super Duty: The heavy-duty member of Ford’s top-selling F-Series lineup will be refreshed with new looks. It will likely feature new powertrain options to make a statement as Chevrolet and Ram attempt to steal sales with their own new models. Toyota Tacoma: While full-size truck customers are famous for their brand loyalty, buyers in the midsize segment are more prone to shop around. However, the Tacoma is an outlier, Sargent said. It has a firmly established fanbase. The arrival of the Ford Ranger and Jeep Gladiator will put that loyalty to the test – Toyota needs the 2020 Tacoma to be a hit in order to fend them off. Chevrolet Silverado HD: GM has already revealed that its 2020 Silverado HD will have a bold exterior design, a 10-speed Allison transmission and a segment-first integrated side step. It’s also expected to improve maximum towing and payload capacity over the outgoing model. Nissan Rogue: Nissan is scheduled to update its 2020 Rogue family of crossovers, which are in high demand. For vehicles that are not pickup trucks the Rogue and Rogue Sport together trailed only the Toyota RAV4 as the top-selling model in the U.S. in 2018. But where Toyota enjoys leading sales across a variety of segments, Nissan relies heavily on the Rogue to keep its overall sales afloat. Ram Chassis Cab: FCA has rolled out the latest generations of its Ram 1500 and Ram HD in the last year. Now it’s time for the medium-duty 3500-5500 work truck, which has a tough reputation and established demand among commercial fleets. Now that Chevrolet is back in the segment there is pressure on the Ram Chassis Cab to deliver. Lexus NX F Sport Black Line: The compact Lexus NX has been a runaway smash for the luxury brand. And just as automakers are keen to introduce pricey special editions of their most expensive SUVs, Lexus is spreading the formula to other models. The Black Line will introduce a 14-speaker Mark Levinson sound system and unique interior styling to the NX. The special edition is limited to just 1,000 units. Land Rover Range Rover Evoque: Another compact luxury crossover with news in Chicago is the redesigned Evoque, making its U.S. public debut. The new model does not feature a radical styling change – it still sports a bulldog-ish stance and round, polished lines. But the 2020 Evoque breaks new ground for the automaker with a range of hybrid and battery-electric powertrains.